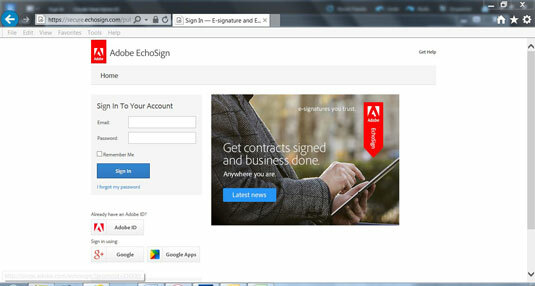 Sign into your EchoSign account. Enter your password or your Adobe ID. The EchoSign Home page appears. 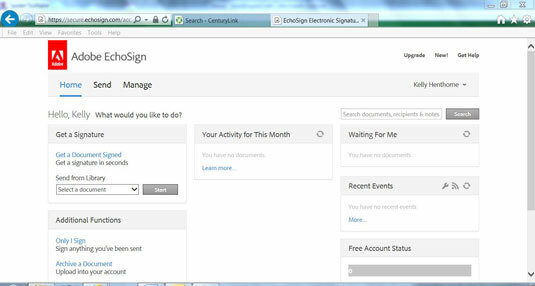 In the Get a Signature area, select Get a Document Signed. Fill out the To: field. 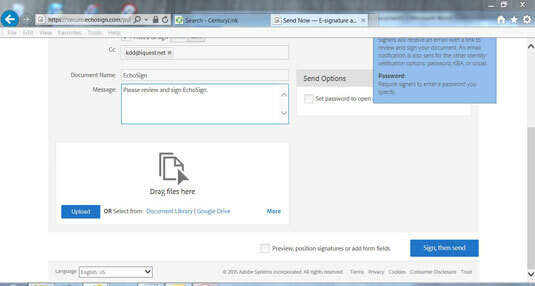 You can enter multiple email addresses in the To: field if you need multiple signatures. You also can copy anyone who needs to see the document (if your boss needs proof that you sent it, for example) by entering an email address in the CC: field. You also have the option to hide the copied person. (Click Show Cc:, and the option changes to Hide Cc:.) 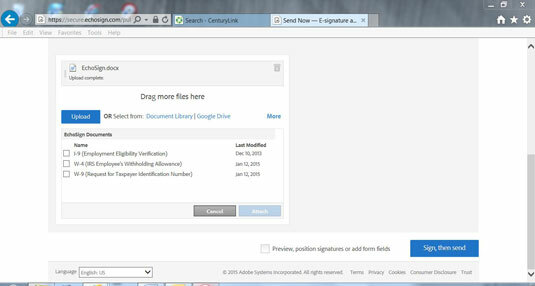 You might want to use this field if you don’t want the person signing to know the document is being routed around. Select the I need to sign checkbox. First or Last appears next to the I need to sign checkbox. Chose First for this example. 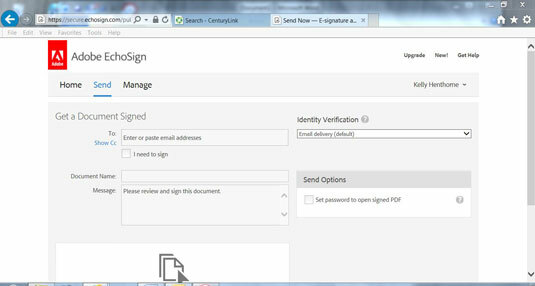 If you fill out the Document Name field, the default message appears: Please review and sign Document. 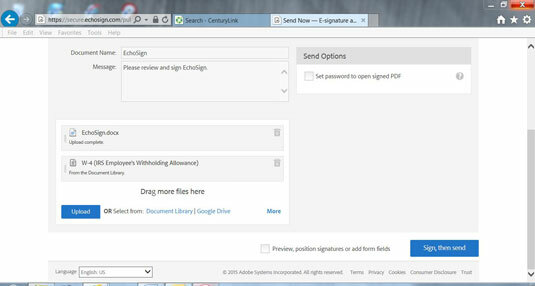 Select the document(s) to be signed. 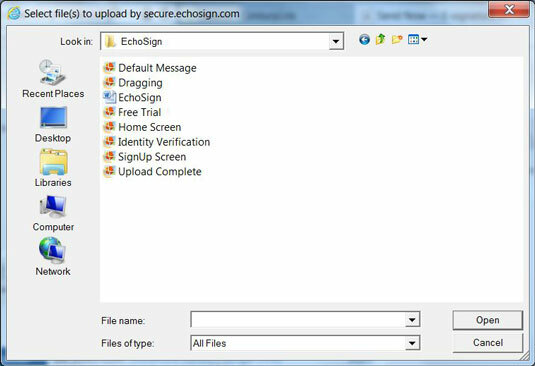 (Optional) Or, you can choose a file from the EchoSign Document Library. These files are available from the document library: I-9 (Employment Eligibility Verification), W-4 (IRS Employee’s Withholding Allowance), and the W-9 (Request for Taxpayer Identification Number). 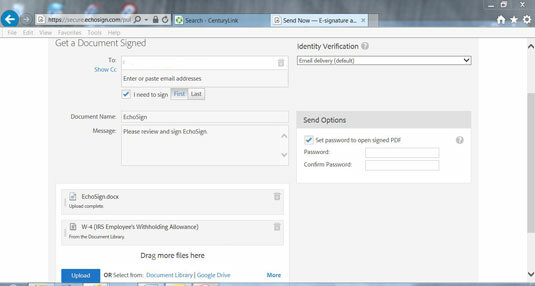 Select the checkbox of the document you want to have signed and click the Attach button. Select your Identify Verification method. 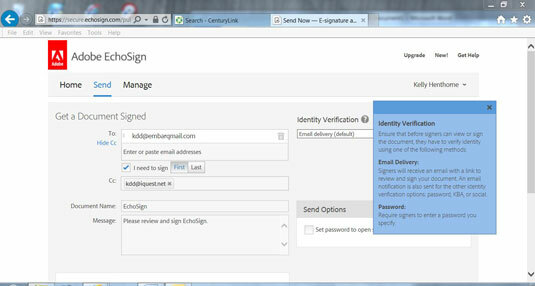 The Identity Verification field enables you to choose to have the recipient verify via an email message or via a specified password. Click the Sign, then Send button. 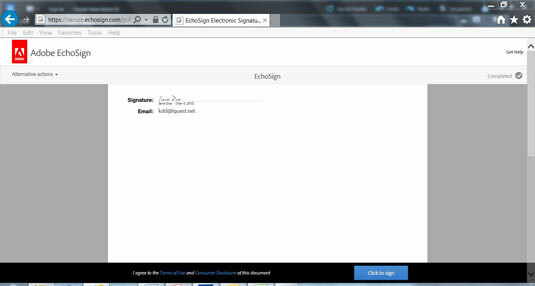 Because you chose to sign the document First, you get a Processing screen followed by the EchoSign screen.